A Rank transformation uses the RANK procedure so you can rank one or more numeric variables in the source and store the ranks in the target. You want to rank a set of numeric data according to some criteria. For example, you might want to rank a set of regional offices according to actual net profitability. Select and drag the Rank transformation from the Data folder in the Transformations tree. Drop it in the empty job on the Diagram tab in the Job Editor window. From the Inventory tree, select and drag the source table. Then, drop it before the Rank transformation on the Diagram tab. 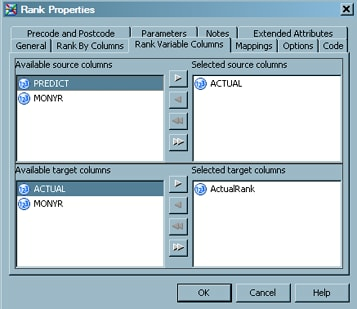 Drag the cursor from the source table to the input port of the Rank transformation. This action connects the transformation to the source. A temporary work table appears after the Rank transformation. You can use this temporary table or delete it and add a target table. In this example, the temporary table is deleted. From the Inventory tree, select and drag the target table. Then, drop it after the Rank transformation on the Diagram tab. Drag the cursor from an output port of the Rank transformation to the input port of the target table. This action connects the transformation to the target. Note that if you have not deleted the temporary work table, you cannot make this connection. The following example shows the sample process flow. Click the column that you want to select in the Available source columns field. Then move it to the Selected source columns field. The source column selected in the sample job is named ACTUAL. Click the column that you want to select in the Available target columns field. Then move it to the Selected target columns field. The source column selected in the sample job is named ActualProfit. Click OK to save the selection criteria for the target table and close the properties window for the Rank transformation. 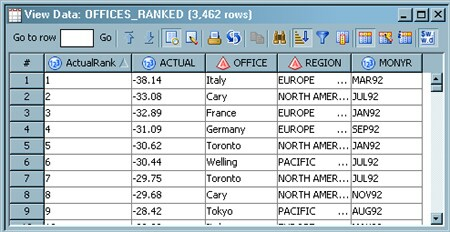 The following display shows the Rank Variables Columns tab for the sample job. Right-click on an empty area of the job, and click Submit in the pop-up menu. SAS Data Integration Studio generates code for the job and submits it to the SAS Application Server for execution.